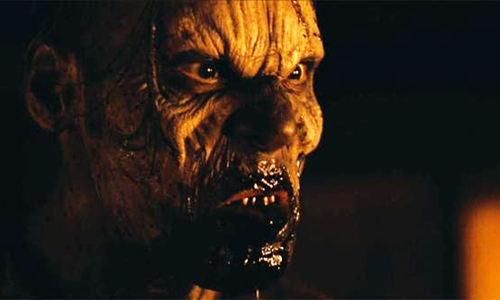 Stake Land struck a chord a few years back with its unique take on vampire mythology, one that gave the bloodsuckers unique, almost zombie-like properties and centered on a perspective on the state of the world closer to a slice-of-life drama than your typical horror flick. While the leisurely, muted pace and rustic visual concentration might be divisive, Jim Mickle's gloomy and methodical horror-drama still hits the mark with its rich characterization and Romero-like social critiques. Once it reached its destination, Stake Land didn't really seem like it required a sequel to the tales of Martin and his surrogate trainer "Mister", even if the vague, open-ended nature of it left the gate open to continue their adventures at a later date. 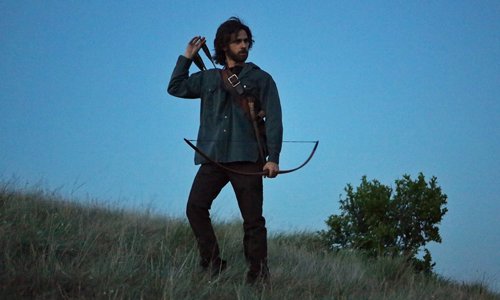 So they have with Stake Land 2, Dan Berk and Robert Olsen's follow-up that aired on the SyFy network, which suffers from the symptoms of sequelitis in how it brings the vampire-hunting heroes back together and curses them with dull motivations for continuing their pursuits. Stake Land 2, also called The Stakelander, picks up several years after the events of the original film (which should probably be viewed before continuing with this review), in which Martin (a weathered and properly fraught Connor Paolo) had settled down in New Eden -- a place supposedly protected from vampires and other threats across the Canadian border -- and built a life for himself with a wife and child. Naturally, the protective nature of New Eden proves to be not so bullet-proof after all, resulting in the death of Martin's family at the hands of The Brotherhood and sending him into a wild-eyed downward spiral back into the vampire-infested expanses south of the border. His objectives are two-fold, yet connected: Martin yearns to exact revenge upon The Brotherhood for the death of his family, specifically upon their new female leader, but he realizes that he'll need the help of Mister (Nick Damici) to reach her. Martin sets out to find his reluctant ex-mentor in those sprawling, desolate lands in which he'll encounter more vampires than people. The original Stake Land ended in such a way that it'd be entirely possible that Martin and Mister might've never seen nor heard from one another again, especially considering this wild-west universe's lack of networked societies and rapid communication. With a skull pendant dangling from a rearview mirror and a clear passing-of-the-torch towards a new companion for Martin, Mister vanished without a trace, free to roam the lands without the baggage of his young trainee. Therefore, the likelihood of these two seasoned vampire hunters hooking up again seemed incredibly slim, something that's inadvertently touched upon in Stake Land 2, as Martin's obsessive search seems more engineered to occupy his idle hands post-trauma than as something that's actually feasible. That's part of the reason why the method of their reunion concocted by screenwriter Nick Damici, also the actor who embodies the Western bravado of Mister and who co-wrote the original Stake Land, seems overwhelmingly engineered for the sake of producing a sequel. Stake Land may not have been a dazzling piece of screenwriting, but the events that transpired within it held onto a decent amount of credibility, as conflicts organically emerge from the episodic travels of the weathered vampire killer and his pupil. Within the first 30 minutes or so of Stake Land 2, however, a seasoned and generally on-edge Martin ends up getting deceived twice and hurled into life-threatening situations. Granted, this strengthens the point that the young widower really does need Mister if he's going to survive very long in the lands outside of New Eden, let alone accomplish any revenging, but it also leaves one pondering how much good he's even going to be as a team with his old compadre. Nick Damici hopes to recapture some of the successful rhythm of the original film's episodic progression with these twists and turns, but the "episodes" fail to convince that they're being handled in the smartest of ways by these seasoned survivors. Cannibalism, slavery, and the persistence of The Brotherhood might dabble in provocative ideas, yet the missteps contained within distract from its grisly shock-value. Directors Berk and Olsen continue the original's picturesque, albeit bleak tempo with Stake Land 2, again tapping into harshness that more resembles post-apocalyptic or pandemic overtones than those of the action-horror breed. That's a crowded cinematic field nowadays, even more so than five years ago, where indies like Maggie and Z for Zachariah have explored complex dramatic themes wrapped around grotesque and/or end-of-the-world settings. Stake Land 2 needed something to make it stand out, and Martin's devil-may-care vengeance, performances that too-closely resemble impressions of other genre actors, and the well-executed stabs of gore surrounding vampires aren't distinctive enough to accomplish the task, all of which follows along an unsurprising connection of events that heavily leans on the (un)trustworthiness of others. Damici flirts with something distinguishing in the form of a feral woman (Laura Abramsen) whom Mister has taken under his wing to care for, but her presence could've been cut entirely with hardly any impact upon either the characters' development or the plotting itself. Stake Land 2 builds toward a gritty, ravenous conclusion that flexes the filmmaking muscle of directors Berk and Olsen, to which they've crafted a visceral skirmish between humans and monsters that convenes in a shadowy flurry of gunfire, pounding drums, and lots of snarling and hissing. Unfortunately, this battle ends up being yet another scenario that transpires only because of groan-worthy carelessness from the humans, leaving very few "episodes" in this film that aren't impacted by that kind of issue. It'd be one thing if this were the kind of vampire horror flick that operated around copious amounts of gore and a significant body-count, but the Stake Land films both feed off the unhurried, austere nature of the drama created around the journeying of Martin and Mister, which makes one take what's going on more seriously than your average stake-through-the-heart flick. Despite the gritty merits of its low-budget craftsmanship, Stake Land 2 misses many of the same marks hit by its predecessor.